Spain’s Foreign Minister says his country is ready to recognize "Palestine" if EU fails to reach a unanimous decision on the matter. Spain’s Foreign Minister on Thursday said his country is ready to recognize a Palestinian state. 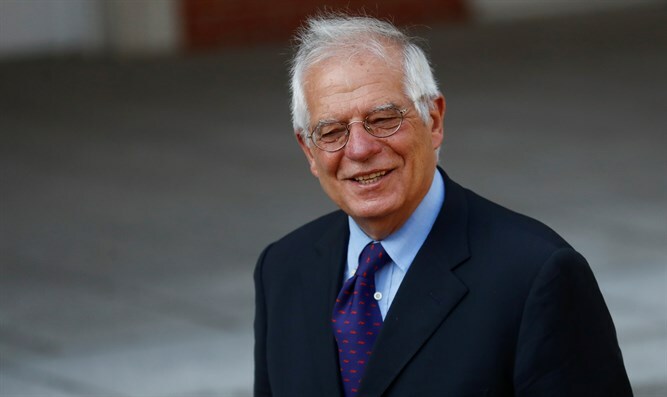 Even if the European Union fails to reach a unanimous decision on the matter, Spain is willing to go the distance on its own, Minister Josep Borrell told a conference of EU leaders in Austria, according to i24news. Individual recognition by Spain of “Palestine” is “on the table”, Borrell told the conference, adding that he would initiate an “intensive” process to establish a consensus on the matter, as EU policy is unclear concerning unilateral recognition. The Palestinian Authority (PA) says there are 139 countries that have recognized “Palestine”. Several European countries have in recent years recognized the state of “Palestine”, but these were symbolic moves that have little, if any, actual diplomatic effect. Spain was one of those countries, having in 2014 adopting a non-binding motion calling on the government to recognize a Palestinian state in coordination with any similar move by the European Union. Last November, PA chairman Mahmoud Abbas urged Spain to recognize the “state of Palestine” in accordance with the recommendation of the local parliament. PA chairman Mahmoud Abbas urged the EU at the start of the year to "swiftly" grant official recognition to the “state of Palestine” in response to US President Donald Trump’s recognition of Jerusalem as Israel’s capital.